When I was in junior high school, it was called Home Economics. That was back in 7th grade. As long suspected, today they "graduate" kids based upon chronological age and little - if anything - more. A high school in Kentucky wants to ensure that when the class of 2019 graduates they have learned a few essential life skills. To ensure that the seniors are ready for the "real world," Bullitt Central High School hosted an "Adulting Day" where students were able to learn about basic finances and how to cook a meal. These professional vegetators just get weirder all the time. When I left college, I had a student loan of $2,000 to repay. Of course, I also worked while in school, and I had a couple of scholarships. So for me, it wasn't a big deal, despite the fact that my parents paid nothing toward college - nor did I expect them to. Once I was out of high school, I didn't live in their home. There were a few hard times, but I managed. How times have changed. A "fundamental transformation" indeed. 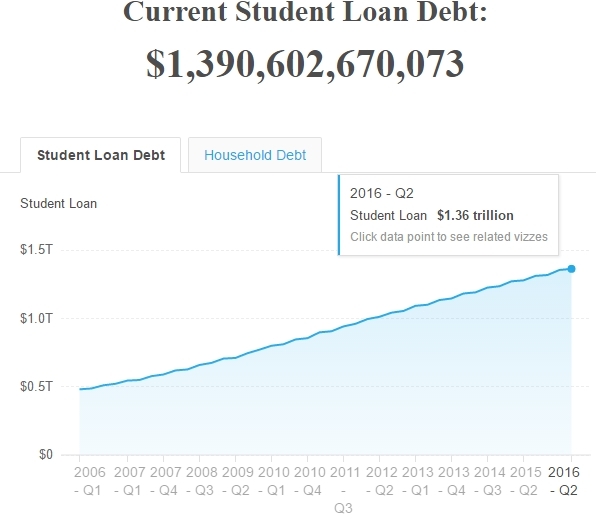 During the Obama years student loan debt increased by nearly 300%. "Long time, no see" is now considered "offensive, non-inclusive language" at Colorado State University. Administrators there (and I use the term loosely) have decided that the greeting is derogatory to people of Asian descent. Eating dogs is still perfectly acceptable; it'd be unsurprising to see dog on the campus menu fairly soon. Leibee also noted that administrators discouraged use of "you guys" in favor of "y'all," which is gender neutral (and ungrammatical, but this is apparently less of a concern). Her column does not claim that administrators force students to use the gender neutral terminology, just that such terminology is preferred. Isn't "y'all" sort of "cultural appropriation"? Just askin'. Reckon that's okay with the "administrators" there, though. A special education teacher in Minnesota on Monday was putt on paid administrative leave following a controversial tweet about killing now-Supreme Court Justice Brett Kavanaugh. Cool, so she gets a paid vacation! The teacher is question is Samantha Ness, who works at Alliance Education Center in Rosemount, Minnesota. According to the staff directory, Ness works the district’s Students With Unique Needs (SUN) program. The program works with students with autism spectrum disorders, developmental cognitive disabilities, and emotional behavior disorders, Alpha News reported. Seems like she ought to be in the program, not "teaching" it. And as is almost always the case with government employees, she gets a paid vacation. Obviously, she's so stupid that properly erasing accounts is just too hard for her to manage. If you don't know how to do that, don't open the accounts. Eating meat "reinforces the patriarchy" according to this perfesser. It's too complicated for you to understand. What's needed is universal healthcare for animals. And the rich people are stealing all the steak from the poor people. If you've ever wondered why kids seem screwier than ever these days, bear in mind that people like this woman are in charge of their vegetation. From the "Hitchhiker's Guide to the Galaxy" files: so long, Florence - and thanks for all the fish! Not satisfied with their safe spaces and trigger warnings, "students" at UW-Madison are always looking for something to be outraged or offended or triggered about. And they've found another one: ice cream. Eight members of the Associated Students of Madison put forth a resolution last week declaring that Babcock ice cream, which uses beef gelatin, discriminates against the school’s Jewish, Hindu, Buddhist and vegetarian communities. A university spokeswoman told Campus Reform, which first reported the story, that the school already produces and sells ice cream, sherbet and lactose-free options that are made with a plant-based stabilizer and are gelatin-free. That ain't good enough. The kids aren't required to go to the store, and they're not required to purchase a product that they may find somehow offensive. That doesn't matter; they want to force the store to alter its products in order to be "inclusive". Maybe you like their ice cream; that doesn't matter. The kids know what's best for everyone. This is why I refer to places like UW as institutions of higher vegetation. And why I sometimes use the category tag "growing vegetables". Both apply. I'm really tired of this insanity. Mark J. Bird, 69, a longtime sociology professor at the College of Southern Nevada, shot himself in the arm late last month — and almost killed himself in the process — all in a bid to stick it to the president, according to the Las Vegas Review-Journal. Well, he's a So-So-Ology "perfesser", so you know he doesn't have much in the way of brain-power. You might say he's a Bird-brain. Police reports note that Bird stepped into a campus bathroom on Aug. 28 armed with a concealed weapon (aren’t liberal professors supposed to be against that? ), left a $100 bill for the janitor (who later had to clean up the bloody mess he made) and then shot himself in the arm. “While waiting for authorities to arrive, Bird said he had shot himself in protest of President Donald Trump, police noted in their report. Well, at least he taught Trump a lesson. Or not. I'd say that next time he should aim a bit higher, toward his head - but when your brain is roughly the size of a pea, it's likely that no real damage would be inflicted. Unless it was purely a lucky shot. See: Evergreen State College, Olympia, WA. What a great learning environment! Though you hate to see so many "students" buried under the weight of so many books.